Key Difference: Stem Cells are undifferentiated biological cells, which means that they are not specialized in any matter, but have the ability to differentiate into specialized cells, as well as divide and replicate to produce more stem cells. Progenitor cell is in between or in the center of stem cells and fully differentiated cells. Today, there is a lot of controversy about stem cell research and its implications on nature, life, morality, and religion. Most of this controversy arises due to the fact that most people don’t even know what stem cells are and why they should or shouldn’t be against it. 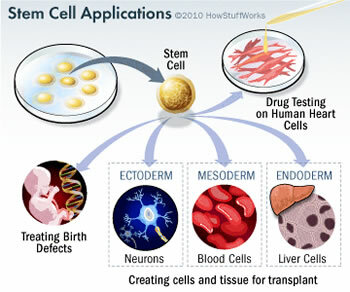 Stem Cells are reserve cells that have the ability to change into many different types of cells and grow indefinitely. Stem Cells are undifferentiated biological cells, which means that they are not specialized in any matter, but have the ability to differentiate into specialized cells, as well as divide and replicate to produce more stem cells. Hence, stem cells are of great interest to the medicinal community, as they have the potential to create many new different cells that can help replace dying and/or damaged cells. Stem cells also have the potential to create new tissue and even whole organs from just a few stem cells. Many systems in our body have a supply of stem cells that helps it to heal and replace any dead or damage parts. Some of these parts include the skin system, liver system, etc., which is why it is easier for the body to heal these parts, as it can just replace the damaged parts. However, there are other systems in our body, such as the heart, spinal cord, brain and pancreas, which so not have a supply of stem cells. Researchers are currently working to develop stem cells that may help us to heal and/or replace these parts. There are four main types of stem cells as categorized by the researchers working with them. These are adult stem cells, fetal stem cells, embryonic stem cells, and more recently, induced stem cells. Adult stem cells are stem cells that are derived from the stem cell that present in adult tissue. Fetal stem cells are stem cells that are taken from fetuses; these are more powerful and have more potential then adult stem cells. Embryonic stem cells are taken from blastocyst, an early-stage embryo usually at 4-5 days after fertilization. Embryonic stem cells have the most potential for differentiation amongst them all. Induced stem cells are adult cells that have been reprogrammed to give rise to stem cell capabilities. Progenitor cell are very similar to stem cells. They are biological cells and like stem cells, they too have the ability to differentiate into a specific type of cell. However, they are already more specific than stem cells and can only be pushed to differentiate into its "target" cell. Whereas, stem cells have the ability to differentiate into many different types of cells. Additionally, progenitor cells can divide only a limited number of times, while stem cells have the ability to replicate indefinitely. The actual definition of progenitor cells is varying as the concept is still new and evolving. However, it can be said that the progenitor cell is in between or in the center of stem cells and fully differentiated cells. Progenitor cells are found in adult organisms and they act as a repair system for the body. They are used to replenish special cells. They also maintain the blood, skin and intestinal tissues and can also be found in developing embryonic pancreatic tissue. The majority of progenitor cells lie dormant and are can be activated in case of tissue injury and/or damaged or dead cells. They exhibit slow growth and their main role is to replace cells lost by normal attrition. Stem Cells are reserve cells that have the ability to change into many different types of cells and grow indefinitely. They have the potential to create many new different cells that can help replace dying and/or damaged cells. Stem cells also have the potential to create new tissue and even whole organs from just a few stem cells. 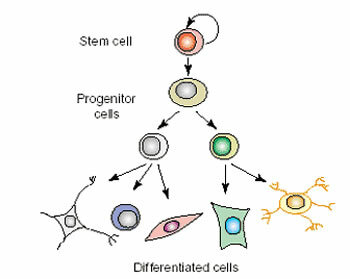 Progenitor cell are very similar to stem cells. They are biological cells and like stem cells, they too have the ability to differentiate into a specific type of cell. However, they are already more specific than stem cells and can only be pushed to differentiate into its "target" cell. Satellite cells found in muscles. Intermediate progenitor cells formed in the subventricular zone. Multiply by cell division to replenish dying cells and regenerate damaged tissues. Generate all the cell types of the organ from which they originate. Potentially regenerating the entire organ from a few cells. Tendency to differentiate into a specific type of cell, but is already more specific than a stem cell and is pushed to differentiate into its "target" cell. Can divide only a limited number of times. They act as a repair system for the body. They replenish special cells, but also maintain the blood, skin and intestinal tissues. Progenitor cells can be activated in case of tissue injury, damaged or dead cells. It leads to the recovery of the tissue. The use of human adult stem cells in research and therapy is not considered to be controversial. The use of human embryonic stem cells in research and therapy is controversial as they are derived from human 5 day old embryos generated by IVF (in vitro fertility) clinics designated for scientific research. The progenitor cells are not subject to controversy.